The CARINA Star Party will be held on 21st March, 2015, at the Tracking Station in Macqueripe, Chaguaramas. Join CARINA in one of Trinidad's most fascinating settings and reacquaint yourself with the beauty of the Caribbean sky. Bring your family and friends and spread out picnic-style with telescope, binoculars or just a simple constellation map. The CARINA Star Party will be held on 29th March, 2014, at the Tracking Station in Macqueripe, Chaguaramas. The Caribbean Institute of Astronomy (CARINA), together with the Cayman Islands Astronomical Society (CIAS), the University College of the Cayman Islands (UCCI),the University of the West Indies (UWI) and the Trinidad and Tobago Astronomical Society (TTAS), hosted a Transit of Venus event at Camana Bay, Georgetown, Grand Cayman. The event was held on the rooftop of the DART complex in Camana Bay, and consisted of public viewings through several H-alpha and white light solar filtered telescopes, as well as a live broadcast of the transit on the Night skies Network website. The event was also carried live by the CNMG TV station in Trinidad and Tobago, where the transit was not easily visible. The transit began at 5:05pm in Georgetown, and was observed until a few minutes before sunset at 7:00pm. The event was a massive success, with about 1,000 people attending the public viewings at Camana Bay. 900 solar viewing glasses were donated by the DART Foundation to the CIAS and were given out to the attendees, but that quantity was insufficient for the crowd that showed up. There were at least 7 telescopes available for public viewing, yet some people were unable to view the transit before the sun disappeared into the horizon haze a few minutes before 7:00pm. Considering that the Cayman Islands has a total population of about 50,000, it was a pleasant surprise to have such a large number of people turn up for the event. The weather was excellent during the event, with mostly clear skies with scattered clouds for the duration of the event. The team in Grand Cayman also measured the ingress contact times of the transit, with times of 22:05:57 and 22:23:02 recorded from observations using a Coronado SM60 H-alpha telescope from Camana Bay for contacts 1 and 2 respectively. Observations and timings were done by Chris Cooke from the CIAS, Isa Mohammed from CARINA and Karen Adam from CARINA. The TV broadcast in Trinidad was very well received. The coverage lasted for 1 hour, from 6:00pm to 7:00pm in Trinidad, which is prime viewing time leading up the the 7:00pm news broadcast. A panel of experts was assembled to give commentary on the event, and included Dr. Shirin Haque, who is an astronomer attached to the University of the West Indies, Dr. Maura Imbert, co-founder and past president of the Trinidad and Tobago Astronomical Society (TTAS), Graham Rostant, co-founder and past president of CARINA, and Yogi Bassie, vice president of TTAS. The panel discussed the importance and mechanics of the transit using video and animation, and brief contact was made with the group in Grand Cayman via Skype, all while observing the transit itself through the live feed from Cayman. Given the unprecedented turnout in the Cayman Islands and the unprecedented media coverage in Trinidad and Tobago, this ranks as one of the largest coordinated astronomy events in the region. 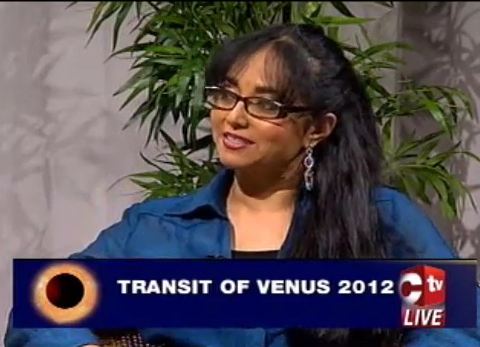 The Transit of Venus event hosted by the CIAS and CARINA was covered extensively by the media both in Trinidad and Tobago and the Cayman Islands. To access the channel lineup, click on the 'View as Guest' button, then look for the CARINA channel. We will begin broadcasting at around 5:00pm Trinidad time, but if you do not see the CARINA channel it may be because we simply haven't started the broadcast yet. If you would like to chat with us online during the broadcast, you would need to register a free account with Night Skies Network, or you can simply chat with us on our Facebook Group. We would like to express our gratitude to the Cayman Islands Astronomical Society (CIAS) for hosting this event.